Sport activity, gathering Russian speaking immigrants/refugees from Ukraine and local youth of Riga. 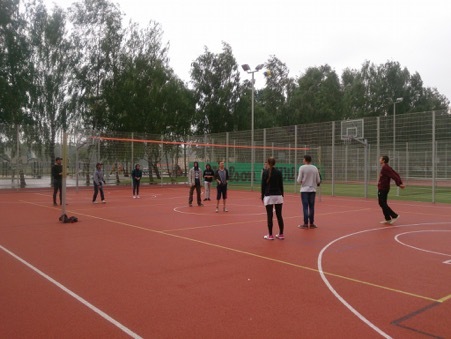 Playing volleyball in Riga suburban sport and leisure center was chosen for this activity. The language of communication was Russian, due to the fact that it was the mother tongue for most of the youngsters involved. An unfortunate rain interrupted the duration of the activity. At first it was not affecting the spirit of youth at all, but after some time the guys decided to look for a shelter to hide from the rain. Atmosphere was great, with lots of laughs and competition spirit. Splitting the groups was challenging because they preferred to be in teams of their already known friends, but at the end the 4 teams became a happy big one.